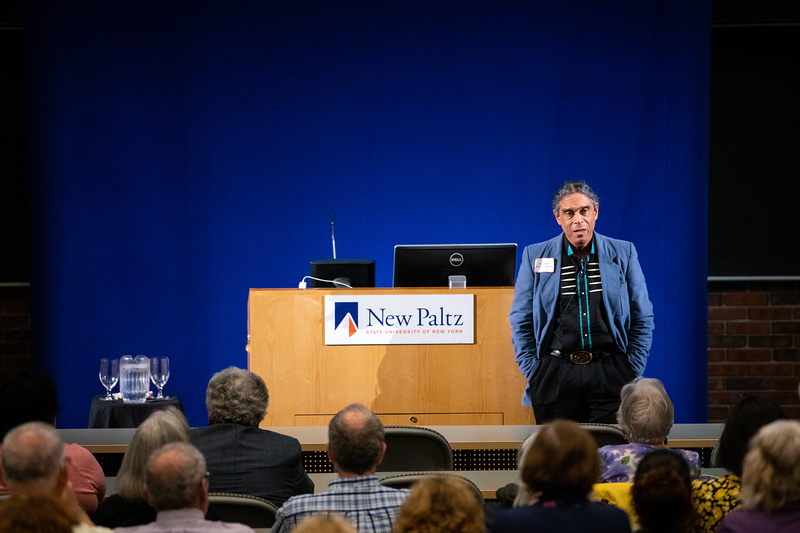 SUNY New Paltz alumnus and indigenous language expert S. Neyooxet Greymorning ’73 (Anthropology) returned to campus on Thursday, Oct. 11, to deliver the fall 2018 Distinguished Speaker Series address before an audience of hundreds of students, faculty, staff and community members. Greymorning’s talk, titled “Wading into the Waters of Language, Culture and Reality,” brought audience members behind the scenes of his groundbreaking research working to understand how dolphins react to human language. Greymorning, who is the creator of Accelerated Second Language Acquisition (ASLA©™), a pioneering language instruction method, is fresh off a summer spent on this project. He worked for weeks in the Bahamas with a dolphin and its trainers, trying to determine whether the animal could correctly identify objects and images after hearing language commands projected through an underwater speaker system. In his return to his alma mater, Greymorning treated audience members to a rare first-hand look at the dolphin in action, with multiple video clips documenting an impressive amount of progress made in just a few short weeks of language instruction. His early analysis suggests that his approach – working to teach language to the dolphin, rather than trying to learn communication patterns from it – has the potential to open a revolutionary cross-species dialogue. “When a dolphin begins to understand that these sounds mean something, and begins to distinguish between them, maybe then they will start sharing their sounds with us,” Greymorning said. Neyooxet Greymorning is a 2017 recipient of SUNY New Paltz’s Alumni Professional Achievement Award. A world-class diver and former member of the New Paltz Men’s Swimming team, Greymorning was inducted into the New Paltz Athletics Hall of Fame on Oct. 12, 2018, in a special Alumni Reunion Weekend ceremony. He is the editor of “Being Indigenous,” a new collection of essays on activism, culture, language and identity, available now from Routledge. Launched in 2008, the Distinguished Speaker Series hosts speakers twice annually in order to connect SUNY New Paltz alumni, students, faculty, staff and community members with highly accomplished alumni, authors, policy makers, leaders, scientists, media experts, business people and other luminaries. The Distinguished Speaker Series is made possible by the SUNY New Paltz Foundation, Inc., with support from the following sponsors: Buttermilk Falls Inn and Spa, Campus Auxiliary Services, Henry’s at the Farm, M&T Bank, NRG Community Solar, Sodexo, and Central Hudson Gas & Electric.